Can Goal Scorers in Lower Leagues Succeed in the English Premier League? [Author’s Note: Usually when I write analysis, I try to be definitive in what we can and cannot say. The point of doing this at all is to learn more about the game of football, and part of the learning is designing a solid methodology that lets you make declarative statements. Teams should have bought Jordan Rhodes. Premier League teams, I mean. They probably should have done it after he scored 7 goals in 14 matches at League Two Brentford at age 19. Instead, Huddersfield bought him for £888K. They certainly should have bought him when he put up a 19G/7A season in 45 starts for Huddersfield in League One at age 20. And again after a 16/1 in 28 starts at age 21. And AGAIN after a 37/3 in 37 starts at age 22. You see, Jordan Rhodes is a massive outlier. Players who produce numbers like he did at Huddersfield – scoring goals at a rate of one per game – are exceptionally rare. It’s rarer still that they do it at such a young age. As something that is rare in the game of football, and with a skill so valuable, you would have thought that one of the Premier League clubs would snap him up as soon as he came to their attention. Blackburn Rovers finally bought him last season for £8.88M, but by that time they were in the Championship. Once again, Rhodes performed, scoring 27 goals for them in 42 starts, and helping keep Blackburn from free-falling into League One like Wolverhampton Wanderers. He might just represent the only good money Venky’s has spent since they took over the club. Anyway, the question this summer once again becomes: Will a Premier League team buy Jordan Rhodes? Obviously the football played in the English Premier League is superior to what is played in the English Championship. Wages are higher, the best players from all different countries play there, and the level of talent is simply much better. But it’s still football. The ball is still round. The goal is the same uniform size. And across Europe, players move up and down between divisions regularly. Why would you assume that someone who posts excellent goalscoring numbers in a different league can’t do it on a windy, rainy night in Stoke? Comparing their best season in the Championship against their best season in the Premier League, I found the scoring rate of players dropped about 20% after moving from the Championship to the Premier League. The average goals per start drops from .48 to .38, 45 of the 52 showed no change to a substantial drop, while 7 guys actually improved their rate. This all makes sense, right? The Premier League is harder, the players are better, and it will be tougher on the whole to score goals. But as the data suggests, it’s not that much tougher. Think about it for a moment. If a player (especially a younger one) scores 20 goals 40 starts in the Championship (a .5 Goals per Game rate), you can expect them to score at a .4 rate in the Premier League. A .4 rate is great! If a player scores at .4 across the season, they can expect to end up with 13-15 goals, which is generally in the top 5 in the league. James Grayson took a wider look at Championship goals at the team level here and he came up with a number of .63. It makes some sense that the most talented players would sustain a higher rate in the transition, so we’re still happily in the ballpark. 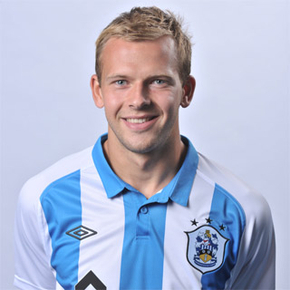 Jordan Rhodes scored at a .64 rate this season for Blackburn (and he’s still young). He scored at a 1 rate for Huddersfield! (Likely unsustainable even if he’d stayed in League One, but still…) Shave an extra 20% off the Rhodes rate in the Championship and you get .51, a figure that would put him in the Top 5 goalscorers in the league nearly every single season. Even if he drops further and scores at a .4 rate, you are still above the threshold where you would say he’s a good player, in which case he would be an easy buy. Now apply the same methodology to Thomas Ince. Still only 21, Ince had an amazing season for Blackpool, scoring 18 goals and contributing 14 assists. That’s 32 scoring contributions in 42 starts. Last season at age 20, he posted a 7/7 in 25 starts (plus 10 sub apps), or about the same as Wilfried Zaha. Shave 20% off this season’s numbers and you get 14/11, which are basically Theo Walcott’s numbers for last season. What would you pay for a 21-year-old Theo Walcott that produces like the current version and showed huge improvement each year? For context, 17-year-old Walcott transferred to Arsenal for £9.25M and then sat on the bench for ages or kept getting injured because he was too small and fragile. Ince is one of the best young prospects in England, and whatever team buys him should end up being very happy with his production in the coming years. And while we’re at it, picture an England team five years from now with Zaha on one flank and Ince on the other. How’s that for a positive mental image? Obviously there is risk involved in buying Championship players (or lower) and bringing them to the Premier League. It is possible that the speed of the game will prove too much for some guys, and they will find that they no longer have enough of an athletic edge to produce like they did with a lower standard of competition. The thing is… that’s true of most transfers. Unless you are buying straight from La Liga and the Bundesliga, you are buying from a less competitive league and hoping the player’s ability translates. Guys like Darren Bent, Ricky Lambert, and Grant Holt have proven time and again that scoring threats from the lower leagues can translate well to the top division. Perhaps not at the rate they did before, but still at a clip where you value their contributions. My feeling is that teams should be pretty comfortable buying guys from English lower leagues, provided they are relatively young (25 or under), and they don’t have some glaring deficiency like a right foot made entirely from goosedown. As I noted above, I’m not happy with the methodology for this piece. First of all, the data for English lower leagues is miserable. There is no reliable shot data available (Rhodes somehow scored 37 goals on 28 shots on target in 2012). It’s nearly impossible to strip out penalty numbers from goals (which you always want to do because they confuse your analysis), and there’s literally nothing else around in terms of data to analyse. I couldn’t break down goals per 90 as I prefer to do, because minutes played isn’t readily available for the entirety of the sample run, so instead I had to use goals per START, which in turn skips any known substitution issues. I would like to do the stuff I am doing for the Transfer Dossiers, but the information simply doesn’t exist. Opta won’t even be doing Championship matches for the first time until next season. Additionally, the guys I ran the analysis on are already sample biased because those were the ones who were considered good enough to get a chance to play in the PL. You can’t analyse all the other good Championship scorers who didn’t move because there’s no data to translate. That said… there’s something here. Teams should feel more comfortable buying good performers from lower leagues than they do. Someone like Jordan Rhodes is a far better value than snatching up Conner Wickham, and yet Wickham moved for £8M after a 9G in 24 start performance for Ipswich two years ago, while Rhodes still isn’t there yet. So yeah, I’m not entirely happy with the methodology, but I still feel like it matters and you can draw useful conclusions from it. Feel free to disagree with me on Twitter or in the comments.